EPUD allows its customers to use its Lunch Room during the work week, starting at 6:00 p.m., and on weekends. 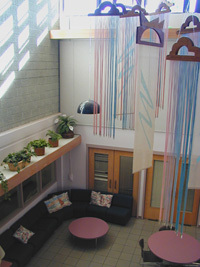 The room is commonly used for club meetings, baby showers, weddings, family reunions, and more. It’s a lovely room, with high ceilings, lots of light, and an attached courtyard. It holds about 100 people, and includes tables and chairs, a full kitchen, and a bathroom. To explore booking the room, call Wendi at 541-744-7439, email her, or submit an online reservation request below. Below you will find current reservations for the rest of the year. You can request to make a reservation using the Meeting Room Reservation link. Once your request is submitted, our staff will review and contact you with any questions. You will receive notification via e-mail or phone regarding the confirmation of your reservation. Once confirmed, it will appear on the Reservation Calendar. Reference the dates below to review the current room reservation schedule. To schedule a room use our Meeting Room Reservation Form.